Happy Halloween! 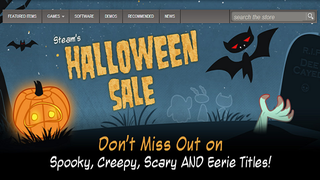 In case your backlog isn't scary enough, Steam's having a new sale to spook you into buying more video games. You can get games like Prototype 2 and Left 4 Dead 2 for 50% and 75% off. Costume Quest is a wonderful deal at $7.49, as is the Fallout: New Vegas ultimate edition (which includes all the DLC) for $15. Other deals include Dead Island for $10, The Darkness II for $12.49, and BioShock 2 for five smackaroos. If Valve were a small business running ads on local television, I bet they'd have Gabe Newell stand in front of a store and scream about how their prices are so low, they're spoooooooooky.